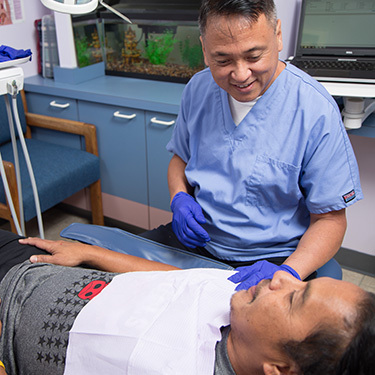 If you’ve noticed tooth pain or sensitivity when chewing or swelling of your gums, it may be an indication that you have an infection in the tooth that requires a root canal. Root canal treatment has often gotten a bad rap in the past, but today’s root canals have improved. The Premier Dental Group HI team is experienced in keeping your root canal treatment as pain-free and simple as possible for you. When an infected tooth is left untreated, it can lead to tooth loss or more expensive treatment. We recommend that you don’t delay if you suspect that you have a problem. A root canal can save your tooth from having to be extracted and minimize any other damage that can occur. A tooth that’s treated with a root canal can last a lifetime. Root canal treatment boasts a success rate of about 95%. Your teeth are made up of several layers. The outermost is called the enamel, followed by dentin. Finally, the innermost layer is called the pulp and includes nerves, blood vessels and connective tissue. The pulp can become infected from decay, cracks or other forms of damage, leading to pain and inflammation. A root canal procedure generally requires more than one appointment. It begins with administering local anesthetic. We’ll proceed only when you’re completely comfortable. Then, any infected tissue is removed, and the tooth root is sealed off. We can place a crown on the affected tooth if its structure has been weakened. If you have a painful or sensitive tooth, don’t ignore it. It’s essential that you get it checked as soon as possible to determine if a root canal is warranted. Contact us today to arrange a thorough dental examination. Insurance can be used for your visit.